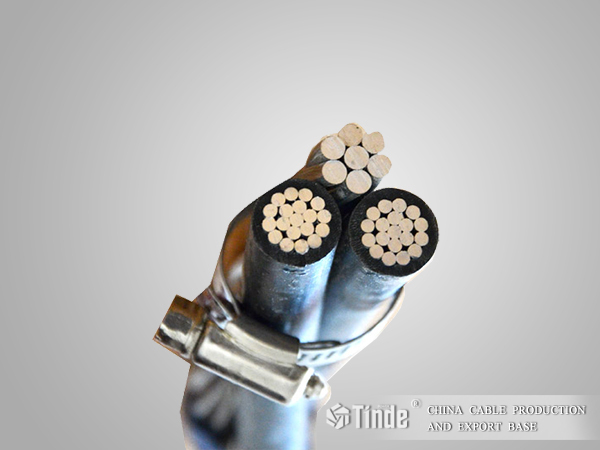 The quadruplex cables are suitable for use as drop cable from a pole-mounted transformer, to the service entrance of a structure, or as secondary distribution between poles. The cables should be limited to the voltages of 600 volts or less (phase to phase) at conductor temperatures not to exceed 75°C for polyethylene insulation conductors or 90°C for crosslinked polyethylene(XLPE) insulated conductors. Quadruplex Service Drop Cable meets or exceeds all applicable requirements of ANSI/ICEA S-76-474. The phase conductors are concentrically stranded compressed 1350-H19 aluminum and insulated polyethylene or crosslinked polyethylene(XLPE), The neutral messengers are concentrically stranded AAC, ACSR, or 6201 aluminum alloy. The conductors are manufactured with ridges for phase identification(one conductor with one ridge, one conductor with two ridges ,one conductor is plain).